This book of interviews is a timely one. At a time when Christianity and religions in general, are under sustained attack from new atheists such as Richard Dawkins and the late Christopher Hitchens, there is an urgent need for intelligent, thoughtful, clear and honest reflections on faith which can be widely accessed and understood. In A faith to live by many of the interview subjects explain how they are able to believe in, and live by, their faith, and also deal with questions and doubts from within their belief and practice as Christians. 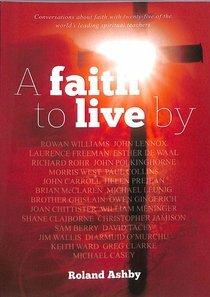 About "A Faith to Live By"
Roland Ashby is editor of The Melbourne Anglican newspaper and director of communications for the Anglican diocese of Melbourne. He holds a master's degree in Theology, and is a Benedictine oblate.